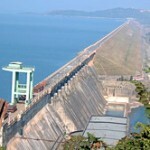 A mere 16 km north of Sambalpur town stands the highest dam-the Hirakud Dam on the River Mahanadi. From horizon to horizon the reservoir forms the largest artificial lake in Asia with a shoreline over 640 km. A 21 km drive on the dykes offers a unique experience of calm serenity. One can comfortably enjoy the sight of the mighty Hirakud Dam and the fantastic expand of water from the top of the revolving minaret called Gandhi Minar on the north or Nehru Minar on the other end of the dam. Considerable number of migratory bird also comes here during winter. This entry was posted in Hirakud, Orissa. Bookmark the permalink.